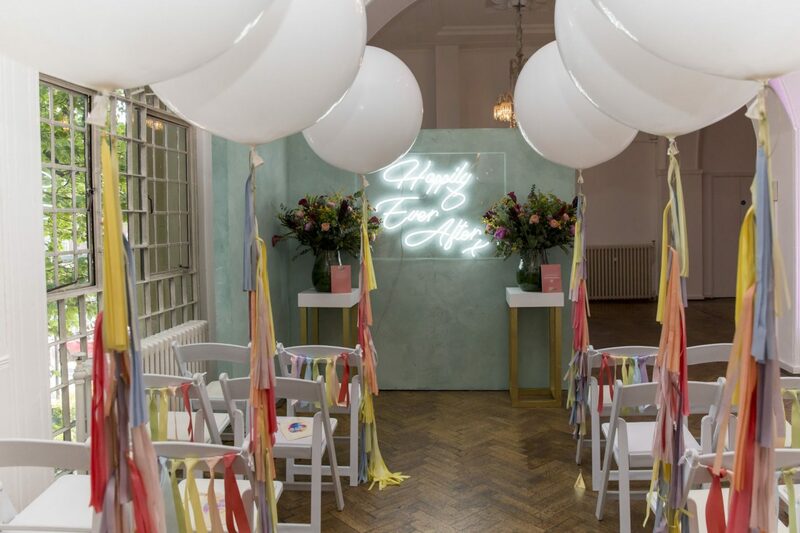 This is more of an inspo post, as I wasn’t actually able to make it to the notonthehighstreet.com Wedding Press Event at One Marylebone back in May, but they were kind enough to send me some images to share. notonthehighstreet.com always does a fantastic job curating it’s collections so it was a serious hit of inspiration when this landed in my inbox – there are so many gorgeous products! I’ve chosen my favourites for this post, some of which tick a lot of trend boxes but most of them I wanted to share simply because they look so pretty! 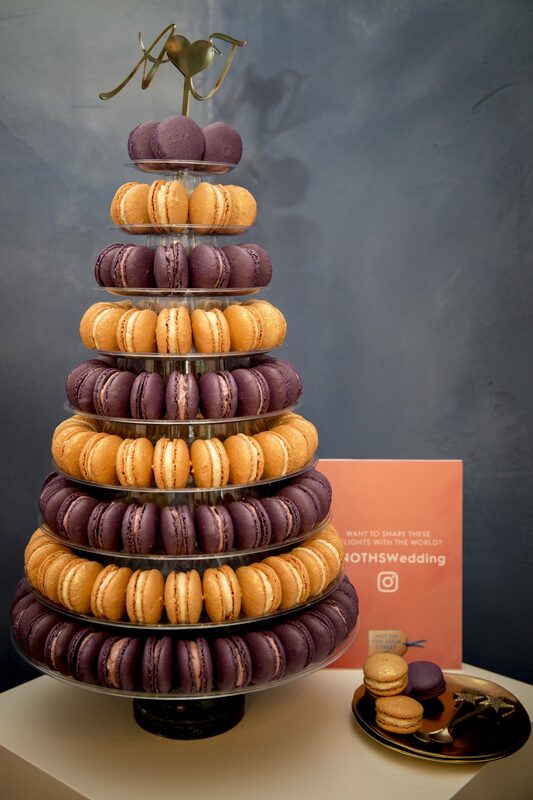 Not only are macarons stylish, chic and pretty but they’re also a great option if anyone at your wedding follows a gluten free diet. The metal cake topper adds a touch of cool personalisation too. Not your average colours and not your average cake topper. Geometric, tick. Heart shaped, tick. Personalised, tick. This bespoke sign is would be great at a top table as part of a centrepiece, or else on its own as a statement cake topper. 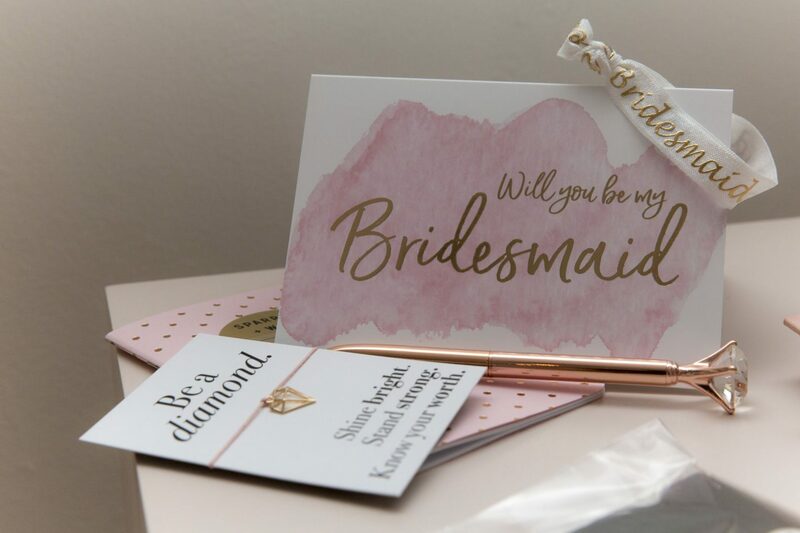 This ‘will you be my bridesmaid’ set it so sweet. Your maids will be helping you so much throughout the planning process so it’s a lovely idea to treat them to a few bits to say thank you. Just a little thing to make them feel special will go a long way, and how cute is the pen?! 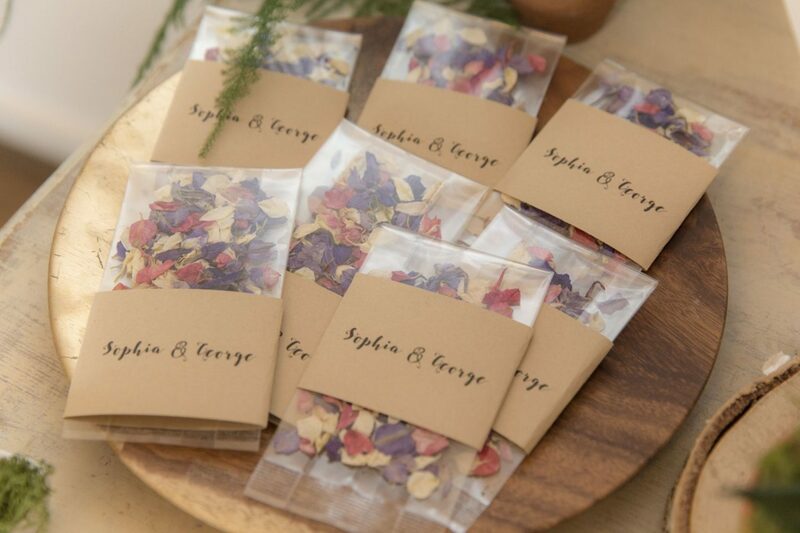 Natural confetti is the way to go, especially if you’re getting married in a council building (your confetti must be biodegradable). The personalised belly bands make these sachets extra special. 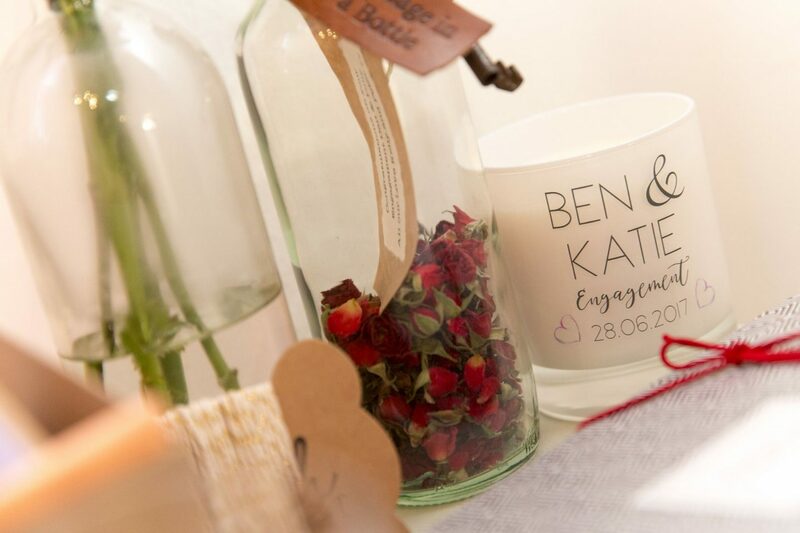 Personalised Alternative Wedding Guest Book Jar by Bespoke & Oak Co. 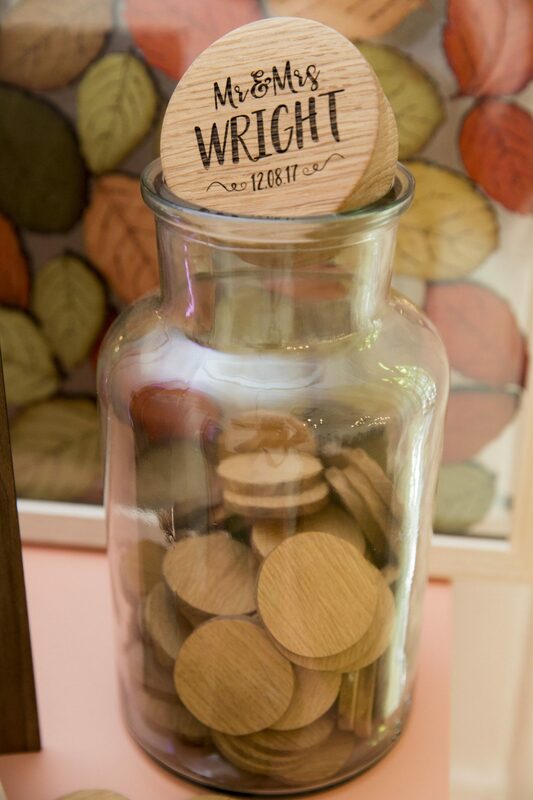 Instead of a traditional guest book you could consider buying a more modern alternative… Ask your guests to sign or write a piece of advice on these wooden tokens and I’m sure you’ll treasure their messages forever. A very cute take on ‘a message in a bottle’. Everyone loves scented candles, and how romantic! Adding a personalised message for the couple is such a fantastic gift idea. Plus, the frosted glass is a sure keepsake, even once the candle has burned away. Stuck on gift ideas? This monogrammed brandy warmer set might just land you in the good books! Add a bottle of posh brandy and you’re good to go. Brandy is back in fashion too you know, move over summer Aperol. What’s better than a regular terrarium? An edible one! Yes, you read right! Brownie, chocolate, cake, biscuits, icing, sugar and meringue all go into making these unique personalised terrariums look as good as they taste! 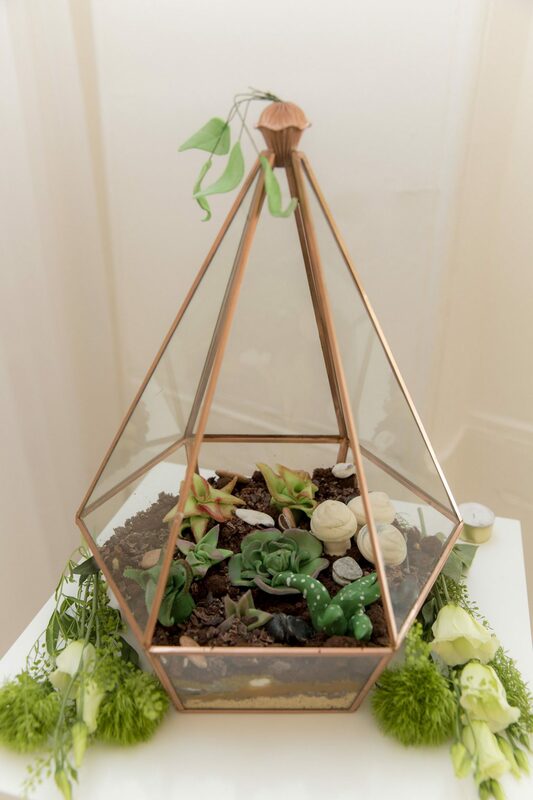 All things tropical, terrariums and cacti are still incredibly popular for a modern take on wedding blooms. This striking copper terrarium would make a wonderful addition to a grown up sweetie table after your tables are cleared after dinner – now that’s value for money! 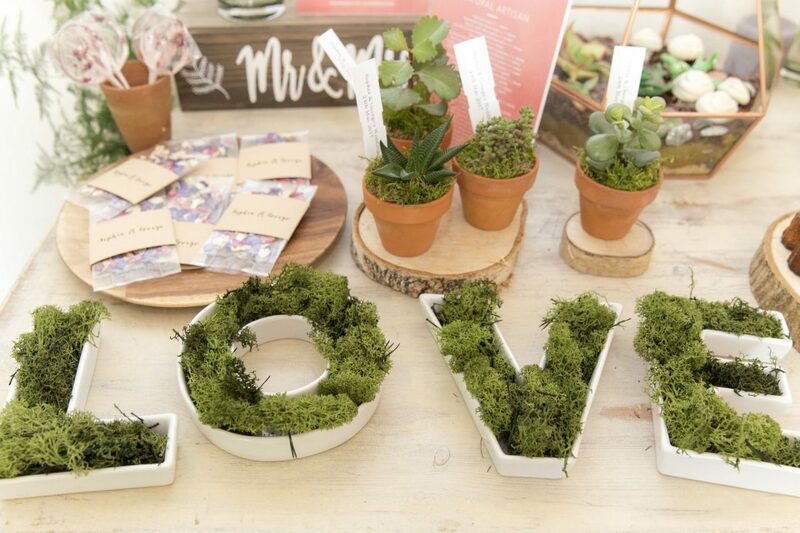 What’s more on trend than a “love” sign with living greenery? This foliage heavy signage will add texture and colour to your cake table – and make a gorgeous feature in your home afterwards too! 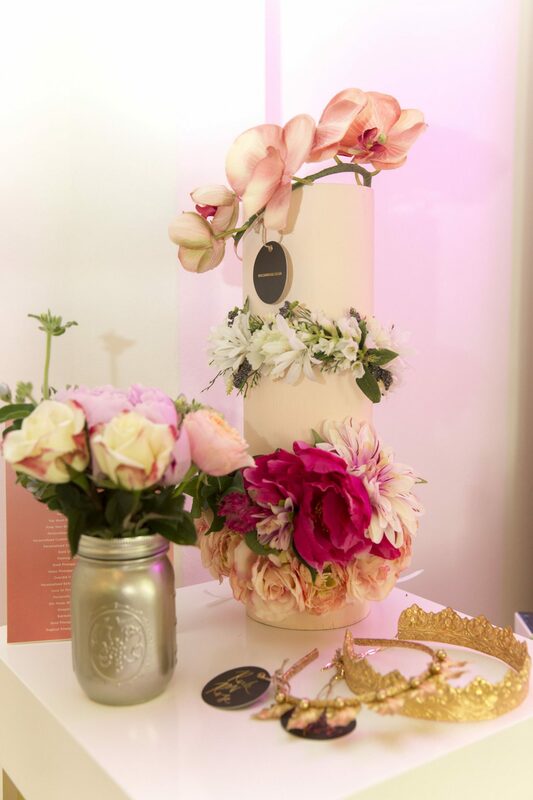 If you want your flower crown to last longer than the day of your wedding take a look at the beautiful range of very convincing faux crowns that notonthehighstreet.com have to offer. They also have a collection of beaded and metallic options if you’re not much of a flower girl. 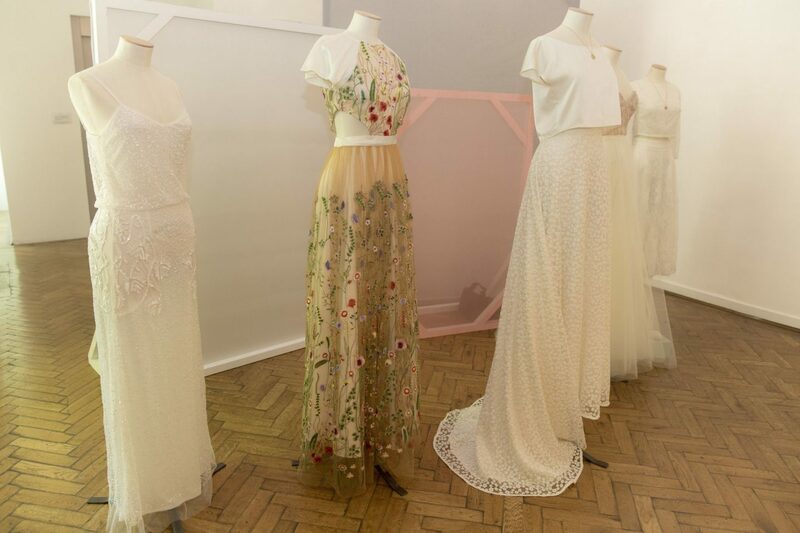 Who knew that notonthehighstreet.com showcases a collection of wedding gowns? The buyers have selected a wonderful group of indie designers that create modern versions of bridal outfits. Think lacey culottes and white biker jackets as well as more classic designs. These giant balloons are a really easy way to add real wow factor to your wedding day. Line them up like the photo above to create a whimsical aisle or simply dot them around the venue to brighten and lighten up the decor. 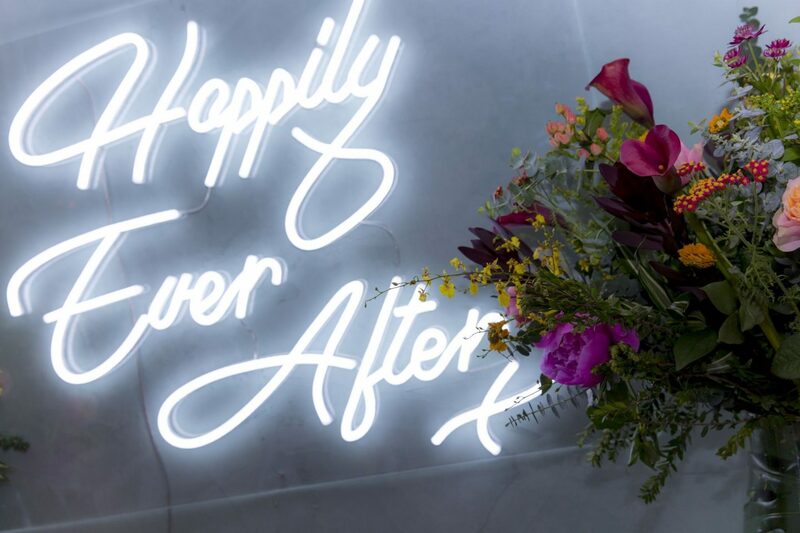 A neon sign like this one will add an industrial edge to any wedding. When combined with relaxed meadow flowers you can create a really unique and fashionable setting for your big day. 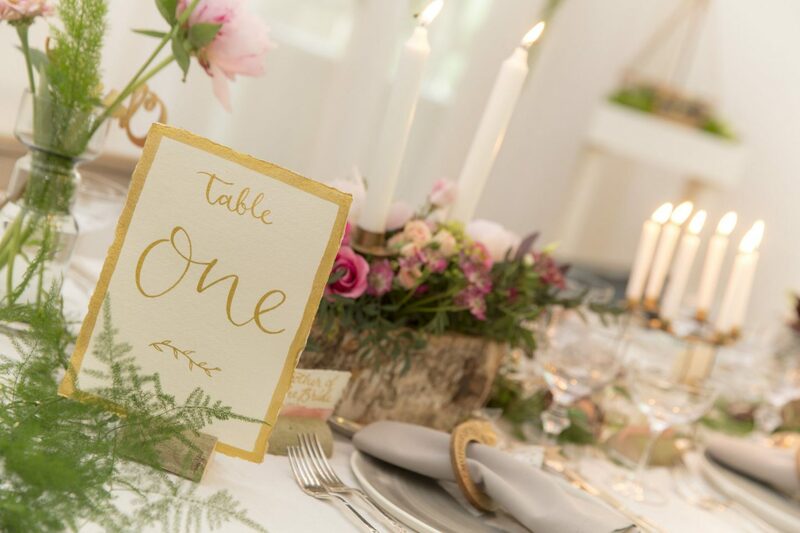 If you’re looking to create a rustic look for your wedding, combine wood with lots of greenery for a relaxed atmosphere. 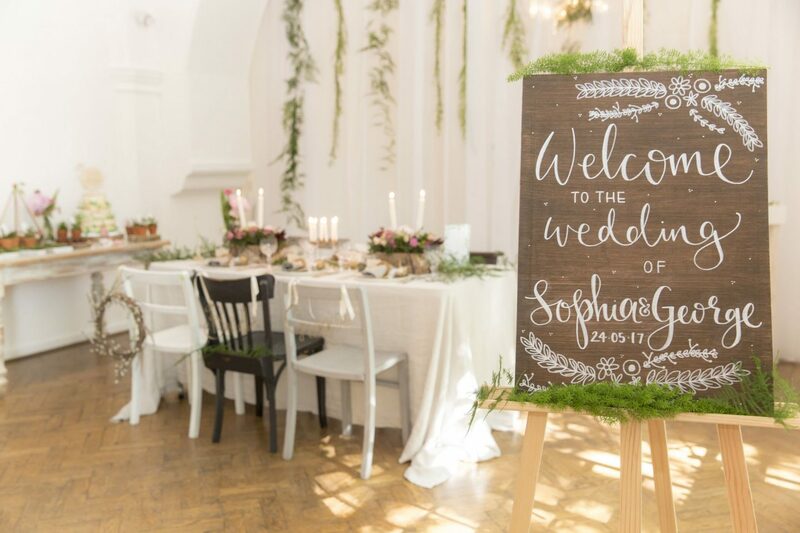 This brush lettered sign is just the thing to welcome your guests. 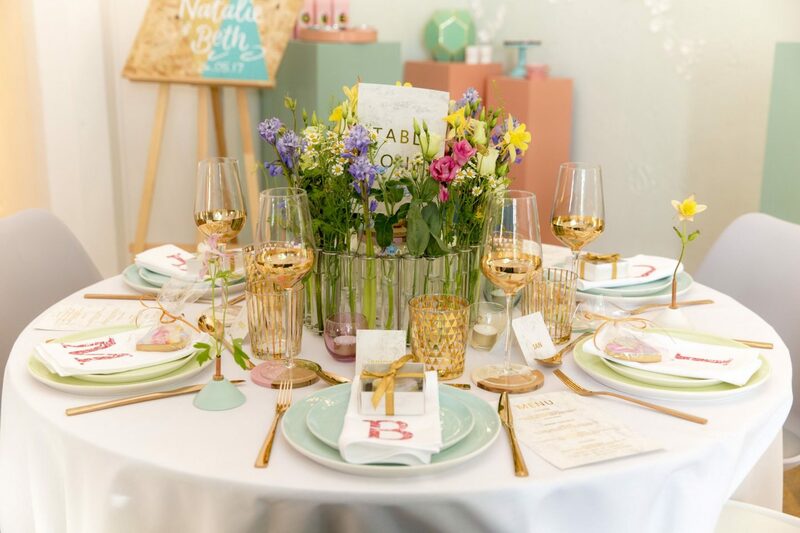 This pastel tablescape is just so pretty. 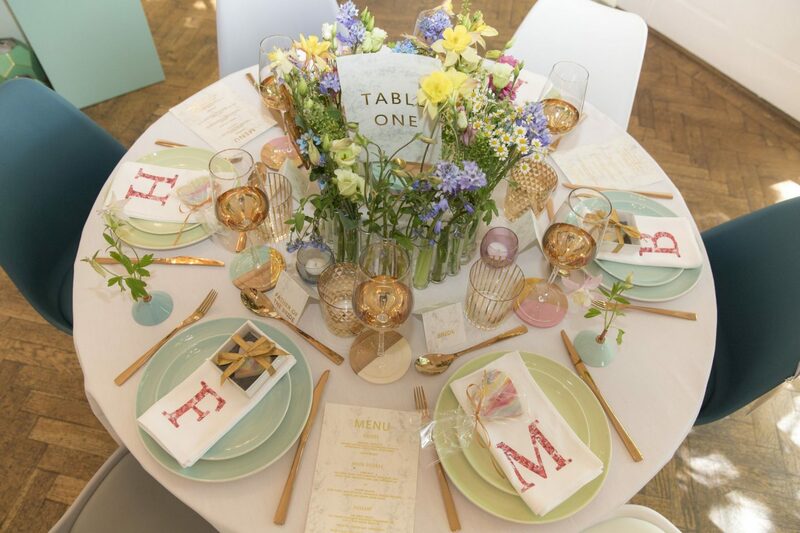 The springtime colours, wildflowers and hints of gold and marble are perfect if you’re looking to create a modern or luxed up version of an English country garden style wedding. This style of table would suit a marquee or large bright room, like a town hall, really well. 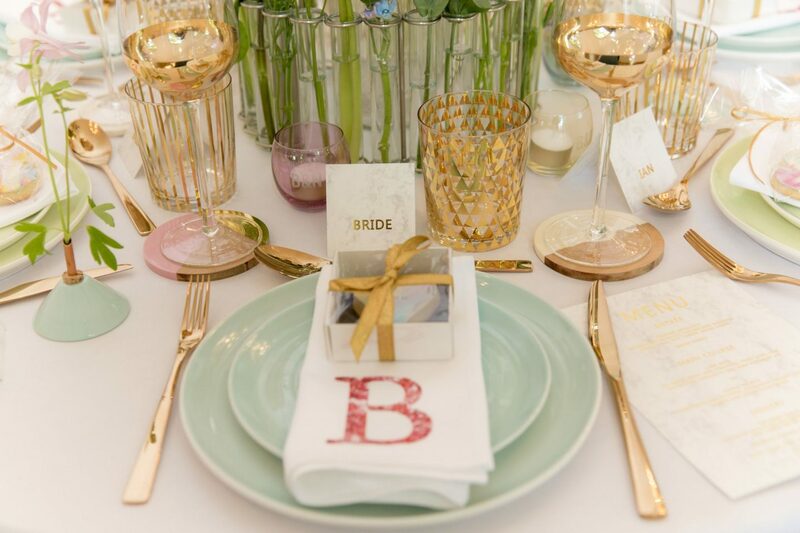 The monogrammed napkins have been made using a Liberty style ditsy print fabric. Its lovely to see some old fashioned and rustic touches in a modern scheme, it helps the styling to look soft and welcoming. elements, contrasting design elements like that make things look more modern. 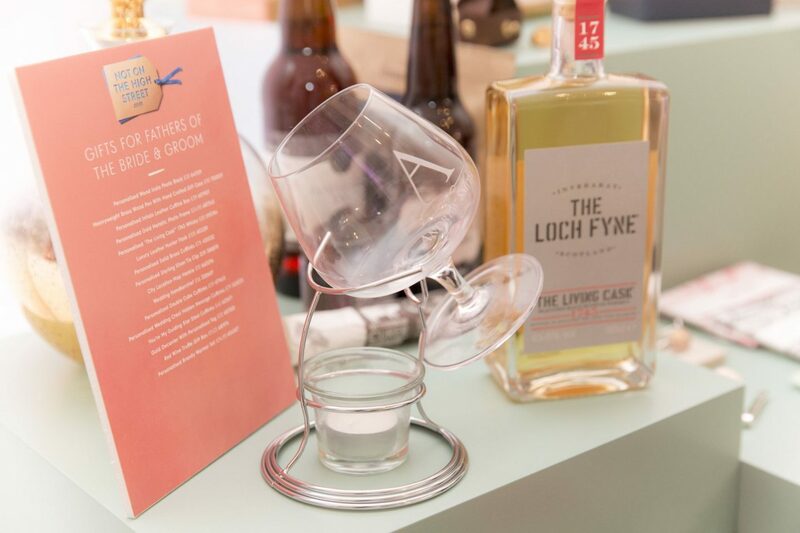 The design on the traditional cut glass crystal is reflected with the asparagus ferns in the background which has helped create a cohesive theme. 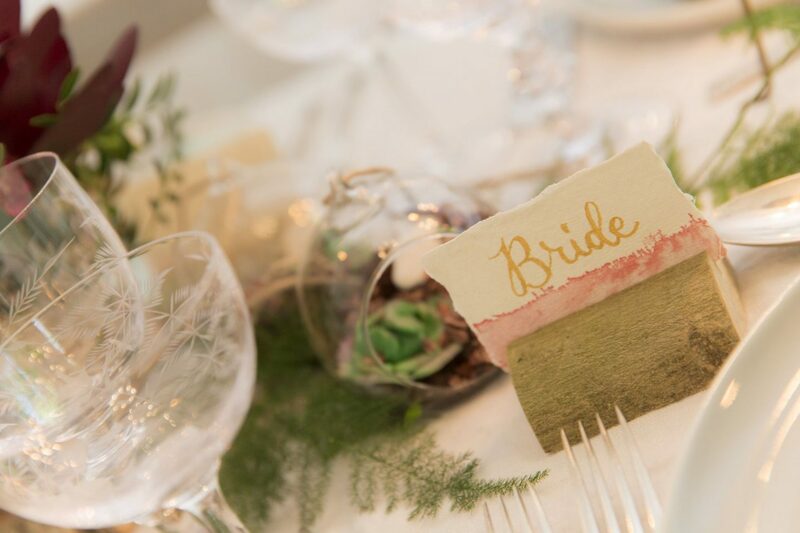 The pink watercolour placeholder is a lovely handmade touch to help the table feel even more relaxed. 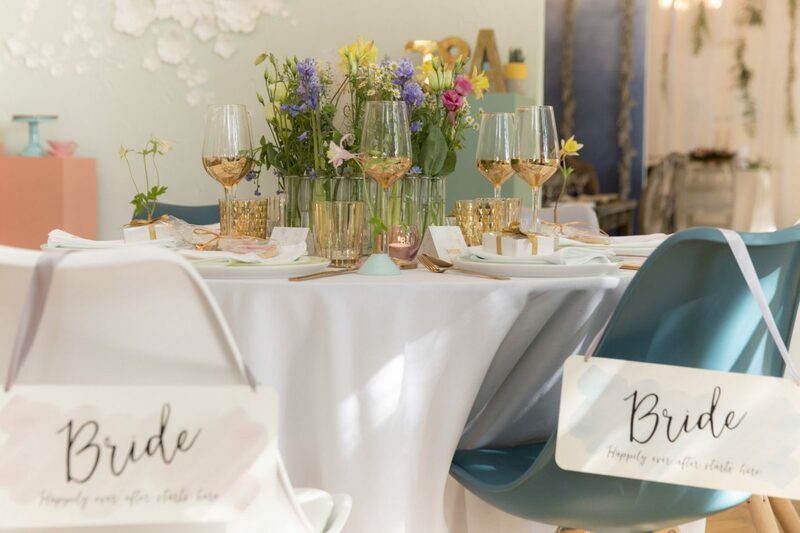 There is so much to love about this table, the mid-century style chairs, the wild flowers, the shimmering gold glassware. Its hard to pick one element out, this styling just goes to show that mixing contrasting design elements can really work. 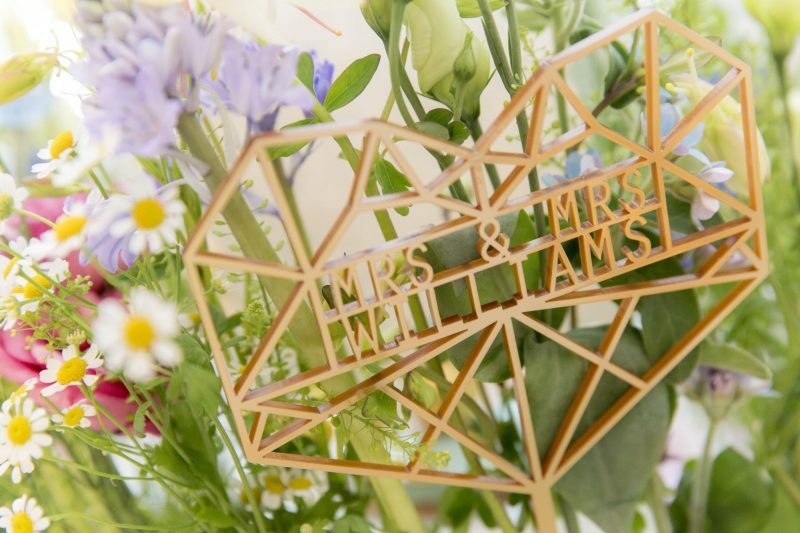 Thanks to notonthehighstreet.com for sharing the beautiful pics. Happy planning, and happy pinning, oh and happy shopping!